Hello and welcome to Engineers Edge. Our mission is to be the preferred online destination for designers, engineers and manufacturing professionals, where all can quickly find a variety of information to aid in the solution of typical and complex technical problems. 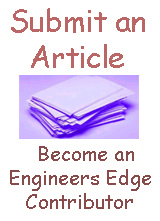 Engineers Edge offers world class engineering on-site training and public seminars. We strive to be your online choice to find technical information, products and training on the web and beyond. More than ever before, speed and efficiency are critical to success within the modern corporation. Tomorrow's products, because of the fast-paced information age, will have to be designed and produced in less time in order to command market share. Engineers Edge's training, product resources and the engineering and design information contained within our pages will assist professionals to expedite successful products from concept, design to manufacturing. We hope that you will find this web site very useful. Please take a moment to comment on our site's usefulness or suggest additions or changes by completing our feedback form.